How to call class this in method with callback? Is there a way to display all validation errors using Sequelize? How to avoid writing browser cookies when running testcafe tests? We've written about 65 tests which all run great. We've introduced a Single Sign On component into our application which has posed some automation challenges. Instead of trying to drive TestCafe against our app AND this particular SSO provider, we're using a fake API call instead. When the React app is being tested, we just provide different URLs which point to a local ExpressJS instance on localhost:3002. 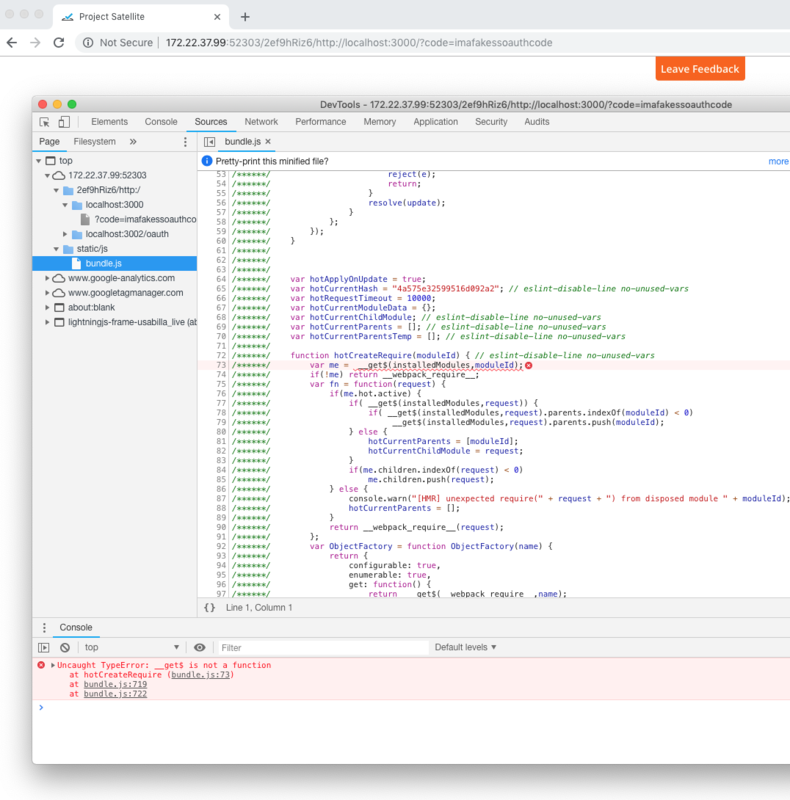 When the React app performs a window.location to the fake SSO API (http://localhost:3002/fakeOAuth) the ExpressJS instance simply performs a response.redirect(http://localhost:3000/?sso=fakeCode) and now we are back to our React app with the additional synthetic SSO data. This scheme works great when not being driven by TestCafe. When we drive the React app via TestCafe, TestCafe hangs when returning back from the fake SSO call to the React app. After this hang, we have to forcefully kill TestCafe on the command line with a ctrl-c.
and a screenshot can be found at the end of this post below. Does anyone have any ideas as to why TestCafe crashes? I have reworked the test a few times, researched and experimented with using TestCafe's Roles and ClientFunction classes but to no avail. Any input would be greatly appreciated. I'm new to node.js and trying to figure out how to show my image thats coded into my html file, when I'm running the .js file through node. I know the html page is working, because all other elements (its a 401k calculator) are displaying correctly, its just the .png file I am having trouble with. I have tried googling it and tried to get express working, but I couldn't get it to show. Any help would be appreciated. How i can call that? I want to paginate my query with Firestore because I have a very large collection (more than 20k documents growing). By pagination I mean displaying an array of numbers to my user, if he clicks on one, it redirects him to a specific chunk of my collection and only fetches this chunk when he clicks. For instance, if I have 100 documents and I want to display 10 per page, I have an array of numbers from 1 to 10. Each time the user clicks, it loads 10 products. I have implemented infinite scrolling with ease thanks to the startAfter() method with this doc on query cursors. However, trying to follow the same documentation for pagination I just don't get it. I also tried to follow this tutorial. This fetch the next chunk of products considering the current chunk (saved in lastProduct), allowing me to make an infinite scrolling that is working perfectly. Even if I had this array, how would I retrieve a specific chunk that is not directly next to the previous chunk that has been loaded? Example, how to query page 8 if my user is currently on page 1? It seems that all the tutorials are directly aimed to describe how to do pagination but I can't get it. Is my definition of pagination wrong? Or are they calling this feature pagination when it is really a 'get next chunk of data' feature...? I need to make scrollable slider for products like in https://www.rolex.com/watches.html. Is there any example, package or library for React to make similar scrollable slider to this? What would you suggest? Thanks in advance. its an infinite loop. We refactored the code so that a user can add a like to a post, retrieve amount of likes for a specific post, and update the state of likes. // time the Component rerenders. // we need the id so expres knows what post to update, and the title being that only editing the title. I'm trying to add material design input to React Native, but unfortunately it renders nothing and I can't find what am I missing. This is my module. I pass two params and return TextInputLayout. I'm setting up a new server using node.js, and want to provide user authentication using passport.js using a middle-ware based on cookies called express-session. Once the user is logged in, I want to restrict the user from logging into another account page by straight up modifying the url www.website.come/tryingrandomusername as he is still logged in. I already wrote a middleware to check if the user is logged in or not and using it to check on my "/:username" route to check the same. I wanted the logged in user to not be able to access another user's account page merely because they're logged in. So, I'm comparing the "user" object that express-session creates for me once a user is logged in to check the requested username (in url) and the req.user.name i.e the actual username of logged in user. Now, the user is able to log in but when they either request refresh the "/:username" page or request "/someotherusername" they're redirected to the login page. I'd appreciate if someone can help me figure out what I'm doing wrong? Should i rather make a middleware to compare the logged in user and the request username on "/:username" ? I have a Sequelize Model with a number of validation rules. Is there a way I can show all the validation errors? I'm new to mongodb, node and express. I I'm trying to save these data in mongodb. what is wrong in this? I'm not able to get success response in postman request. I want to call this function in my testcafe test script. I am running the testcafe tests for a website. I want to avoid writing any browser cookies while running my testcafe tests. My website writes cookies but while running tests I want to avoid this. Is there any way to achieve this in testcafe? We have smoke tests that run shortly after deployment on our web application. Sometimes it takes the login page takes a while for its first load. firewall settings, server outage, or network problems that make the server inaccessible. I'm hoping that adding a setPageTimeout in my Roles will solve this issue, however, I can't confirm until Tuesday. Can anyone confirm if setPageTimeout is the way to go? If not, is there a solution available?